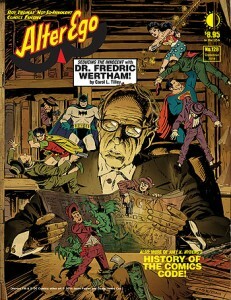 Wertham lives in Alter Ego #128!!! Dr. Freddy Wertham, that loveable old scamp who nearly destroyed the comics industry in the 1950s, is featured in the new issue of Alter Ego (#128, shipping today from TwoMorrows). And as a companion piece, we present more of our history of the Comics Code (which came about as a result of the good doctor’s crusade). You can find it HERE! This entry was posted in TNT on 13 August 2014 by Mr. Morrow.